This review was published in The Straits Times on 6 January 2015 with the title "Violinist and pianist soar on Nordic trip". 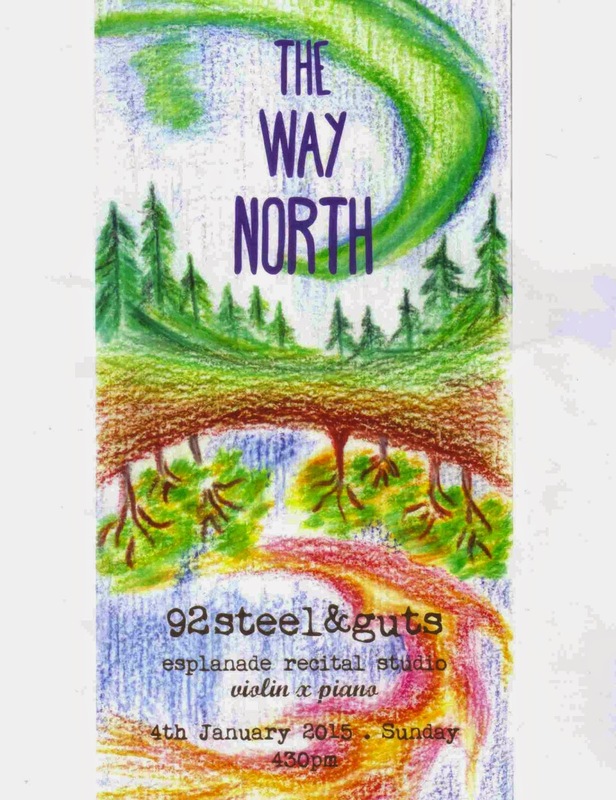 92steel&guts is the name of a duo formed by young violinist Tang Tee Tong and pianist Wong Yun Qi, 92 being the sum of strings to be found on a piano and violin. Its concert debut attempted to add a new gloss to the tried and tested format of a chamber concert. 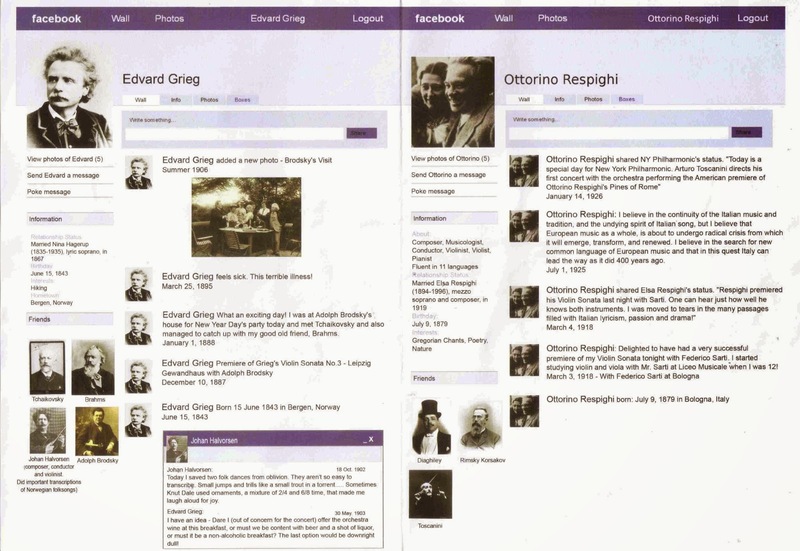 Patrons were asked to register online, and enter the hall with a programme leaflet in hand, one specially designed to look like Facebook pages of the composers featured (below). They were also given the freedom of donating whatever they wished to defray the production costs. Before the music began, an “inflight” announcement was made in English, Chinese and Malay (what, no Tamil?) as listeners embarked on a journey to the Nordic climes of the land of the first composer, the Norwegian nationalist Edvard Grieg. In semi-darkness, the voice of soprano Choy Siew Woon rang out from the left rear as she sang a collection of Norwegian folksongs collected by Grieg and his compatriot Johan Halvorsen. The bucolic nature of these songs ranged from a yodelling-like number Kulok to the more rhythmic Springdans and Halling, the latter dance to be found in the finale of Grieg’s Piano Concerto. Tang’s violin from the right rear simulated the Hardanger fiddle, the folk instrument of village minstrels and bards which Grieg’s music popularised. This rustic setting properly set up Grieg’s Third Violin Sonata in C minor, his most important essay in this medium. Alternating between darkness and light, Tang brought out the music’s movement and drama with a warm burnished tone, and no little agility. One only wished she did not stamp her foot so emphatically on the floor as she performed. The slow movement was introduced by Wong’s excellent and responsive pianism, the resonance of which was highlighted by timely pedalling. The song-like atmosphere then broke out into a little dance, the spirit of which was multiplied manifold in the celebratory finale, which was both vigorous and nostalgic to its raucous end. Contrary to the concert’s title, the flight changed course and headed southwards to Italy, with a rare performance of Ottorino Respighi’s Violin Sonata in B minor. Its virtuosic demands deter many, but champions have included Jascha Heifetz, Kyung-Wha Chung, Tasmin Little and now our Singaporean duo. Another darkly hewn work, Tang and Wong stewed in its late Romantic colours and subdued melodies with an impressive end result. Again the central slow movement was beautifully rendered, from its quiet mysterious piano opening, with both hands in unison two octaves apart, and rising to a passionate and climactic effulgence. The finale was an unusually tricky Passacaglia, with rapid shifts in dynamics and multitudes of notes to tax both performers to the hilt. There was to be no safety first measures, instead the duo went for broke, finishing with a stunning aplomb and an abruptness that caught the audience completely by surprise. Then the deserved applause rang out. There was to be no encore, but a return flight by 92steel&guts Airways will be a welcome prospect. (extreme right) and the production team.